Have a loved one who seems to spend all of their time in the kitchen? Maybe they’re a busy mother of several, or just look cooking up something new. No matter their reason for being there, here are a handful of gift ideas to suit every budget. Read on to find out what they are. Your friend or family might love being in the kitchen. It might be their happy place! If this is the case, see if there are ways you can make spending time there even more enjoyable. The great thing about this gift idea is how it works for any budget. If you really want to splurge, think big. Could you replace their oven, or get them a gorgeous, colourful aga, like these from the aptly named Aga? For a medium budget, how about a kettle that lights up. Or, if they love a cuppa in the morning, a kettle that can be switched on from an iPhone! As for lower budgets, the great thing about kitchen equipment is that the smaller items are quite affordable. You could get a measuring mug or a set of personalised wine glasses. See if you can find out if there is anything they are missing or have recently broken. Even a new set of tea towels in an attractive design will be appreciated and regularly used. An alternative to buying them something is hiring a professional to do a keep clean of the kitchen. The more a kitchen is used, the more that dirt, grease and grime can build up. Not only is cleaning not all that fun, but also extra-strength chemicals are sometimes needed to clean things like the inside of an oven. You’ll be saving your gift receiver money on needing to buy those products. Plus, who wouldn’t love having somebody arrive at their home and do a big chunk of their cleaning for them! Even the most enthusiastic chefs love to be treated like this once in awhile. Be sure to give them plenty of notice on date and time ideas. That way they can schedule any work around it, and fully relax while they’re there. It also gives them time to get excited about it! Consider the location carefully. If they’re super busy all the time, don’t make them travel far. That being said, they may have already been to all the good restaurants in their local area, so travelling a short way might be necessary. See if there are any places that have just opened recently, or been newly refurbished. Or, ask your mutual friends and family if your gift receiver has mentioned wanting to go anywhere specific. Alternatively, if you’ve got more time on your hands, make an evening out of it. Take them somewhere you can get dinner and then enjoy an activity afterwards. Mix it up a bit. You could take them to Blackpool, head to the White Tower Restaurant and then go for a walk along the promenade afterwards. Or, if your friend loves movies but hasn’t been for ages, follow dinner with a trip to the cinema. Upgrade to premium seats and buy them a big box of popcorn- if they’re not too stuffed from dinner, that is! Also, be sure to consider the type of food the restaurant serves. Does your friend or family member have any allergies, dislikes or preferences? If they only like tuna, don’t take them to a fish restaurant! However, if you think they will appreciate it, you could think about taking them somewhere slightly out of their comfort zone. Do they always eat Chinese? Try them out with Thai food! Keen cooks are often super keen to experiment. This might be with new flavours, new textures and entirely new foods. A great gift idea for kitchen enthusiasts is a hand-packed hamper that you have put together yourself. Themed baskets are a great idea. They also mean that you can get the items from lots of different places, but they will still match. For health buffs, how about items great for a detox? Or, if they love spicy foods, you could collect different spices, oils, pastes and sauces that each has a different kick to them. Another idea is to make them items they might have come across before. Garlic oil, or pink salt, for example. Items like this are great because they will get to use them often and in lots of different recipes. Finish the hamper with a box of chocolates and a nice bottle of wine and you’re set. There are plenty of reasons why you should include the Czech Republic on your list of European destinations to explore and, in particular, its capital: Prague. Airport shuttle services will quickly and cost-effectively take to your to accommodation and the local drivers will happily offer tips and recommendations. There Is So Much On Offer: Where Do I Start? Prague’s stunning, imposing stone architecture will immediately seduce you, and the food and drink will have you dreaming of returning before you even leave! If combining the two sounds like a fun idea, you’re in luck: the city’s festivals are renowned for offering an unforgettable taste of both. In May of every year, Prague hosts the impressively varied and sophisticated Food Festival at the Royal Gardens in Prague Castle. You’ll probably have passed the medieval fortress whilst on your Prague airport shuttle coming into the city, so you’ll be able to appreciate just how this annual event provides a wonderful combination for your senses. In a country where fine dining still has to be fully developed, the Food Festival offers you the opportunity to delight your taste buds with dishes by the best chefs and restaurants in the city. Aside from amazing food, you will find coffee, wine and, of course, beer aplenty, as well as delicious treats for dessert. If your attention was piqued by the mention of range of beverages available in the city, you might be interested in attending one of Prague’s excellent wine and harvest festivals. Taking place all through September, there are three consecutive events in the capital: perfect for both advanced connoisseurs and beginners. Tell Me About All Of Them! The Festival of the Grape Harvest is held at Prague’s Botanical Gardens, on the outskirts of the capital. It celebrates local winemaking and allows you try various wines produced in the surrounding areas, while live music and food stalls will entertain you into the evening. Prague Castle hosts the Festival of the Grape & Wine Tasting, which commemorates harvest season. With many different types of wine available, you will discover new thirst-quenchers such as Bur ák, a partially fermented young ‘not-quite’ wine. Last but not least, there is the Saint Wenceslas Vines Festival at the very end of September. Its chosen accompaniments for wine tasting are knightly contests and live music – making for the perfect pre-dinner entertainment. Unfortunately, all good things must come to an end. You have eaten, drank, and danced to your heart’s desire and have had a thoroughly enjoyable break. With your bags packed and your Prague airport shuttle waiting for you, prepare to say farewell to this breath-taking city that has stolen your heart. But rest assured: whether it’s in a year or in a decade’s time , Prague will welcome you back with open arms. Many people visiting Prague do so to explore the culture, art and history. Others, however, come specifically to enjoy the fabulous cuisine if the city. 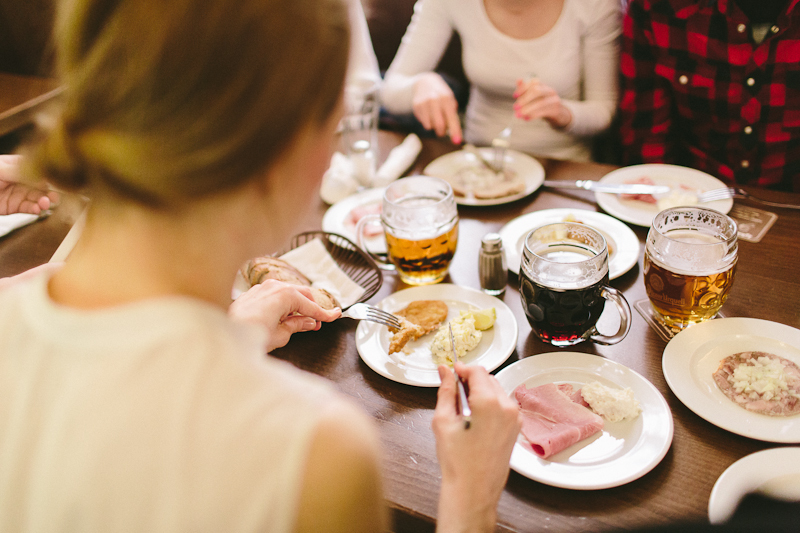 But even if food is not your main focus while in Prague, eating as the locals can be a very rewarding part of your trip. If you’re arriving via Prague airport, transfers into the city are quick, efficient and easy to book. Prague airport transfers can be organised privately or on a shared basis and they make getting into the city a pleasant and relaxing experience. Before you know it you’ll be out and about soaking up the sights and sampling the delicious cuisine. A fabulous combination of German and Hungarian goulashes, schnitzels and strudels, Czech cuisine also boasts many interesting elements of its own. Main course options usually include the three national foods: vepro, which is pork; knedlo, which are dumplings; and zelo, which is cabbage. The pork is usually lightly seasoned and baked, smoked or breaded and fried. The dumplings can come one of two ways: either light and spongy or dense and thicker. And while you may think that the cabbage might be prepared like the German sauerkraut, you would be wrong. Czech cabbage is boiled and served with a delicately flavoured sugar sauce – delicious. While every restaurant has its own take on the three staple main courses, they are the standard Czech dishes that really must be sampled. Rostene and uzeniny, are spicy cured meats, which are also popular additions on any menu, while cmunda, is a dish made of a steaming potato pancake topped with Moravian pork and boiled sweetened red cabbage. Main courses are often served with sauces that may at first appear heavy and bland, but when served with spicy meats and tangy cabbage come deliciously alive. Washing your food down with the local brew is par for the course in Prague, and the Czech Republic has a steadfast tradition of producing excellent beer. 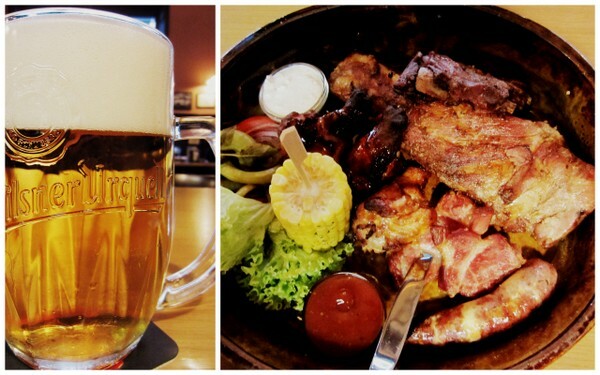 Pilsner Urquell and Staropramen originated here and Czech beer is nothing like the beers of Western Europe and America. Lager is the mainstay but a few breweries make ales too. When choosing a lager at one of the city’s hundreds of pubs, make sure you order a 10 degree light lager if you want something with a lower percentage of alcohol, or the 11 or 12 degree larger if you fancy something a little stronger. When you’re travelling into the city on Prague airport transfers, it’s also a great idea to ask your driver for any suggestions for where to eat and what to sample. Local knowledge is a priceless gift when travelling , so make the most of the journey on the Prague airport transfers to your accommodation. If you’ve made your upcoming trip to Prague public, it’s highly likely you will have been told by numerous friends and family members how special the city is and how you’ll inevitably fall in love with its indescribable character. And, once you get there, you will understand completely why people often refer to it as one of the best holiday destinations in the world. Prague provides all the things to satisfy a seasoned traveller: a unique and varied cuisine, plenty of locally brewed beer and wine, and a host of adventures to sweep you away. From the moment you step out of the airport transfer service vehicle onto Prague’s charming cobbled streets, the possibilities truly are endless. So if you want to ensure your holiday doesn’t simply resemble a travel agency’s dos and don’ts, make sure to give these activities a go. The best way to experience a region’s local cuisine is to not just look at restaurant menus and Internet recommendations, but to dig a bit deeper; one of the best ways to do this is to get your hands dirty and make the food yourself! Although this might seem tricky to do in a foreign country, a cookery class really can be quite easy and affordable, as long as you book in advance. Just one example, ChefParade’s cookery classes are an absolute must-do for both foodies and seasoned chefs. Firstly you will go on an excursion to the market to purchase fresh ingredients with your assigned chef, who will happily give you tips and interesting facts. You will then go back to the state of the art kitchen to get started on your delicious three-course meal. Classes last around four hours and you can choose from individual, couples, or group lessons. Make sure to cancel your dinner reservations, though – you really won’t need them! As may know, the Czech really do love their beer – and this certainly shows on the 17-day beer bonanza that is the Czech Beer Festival. Over two-and-a-bit weeks, the best Czech breweries, wineries, chefs, and bakers all congregate in one place to win visitors over with their delicious creations. If you decide to plan your trip specifically to coincide with the festival, rest assured you are not the first and won’t be the last. The festival is very popular, so ensure you book your airport transfer service to your accommodation as soon as you decide on dates. With over 40 Czech beers to try each day, a huge variety of live music, and a family-friendly atmosphere, the Czech Beer Festival is an event where every age group will find something to enjoy. If you’ve been enjoying indulging in Czech food and beer and feel a bit of exercise wouldn’t go amiss, Biko Adventures offers different kinds of energetic activities. Not only can you discover the refreshingly spacious surroundings just outside Prague on a mountain bike, you can also experience trail running or, for something really different, one of the river surfing tours. With activities requiring varying levels of endurance catering to both absolute beginners (albeit ones that can ride a bike) to professional cyclists, this friendly, local company will provide you with a different vantage point from which to explore Prague. If you’ve been hard at work exploring Prague’s outskirts on a bike or surfing its rivers , you might want to treat yourself to the luxury of a personal airport transfer service for the trip back so that you’ll be picked up from your accommodation and be saved the trouble of carrying heavy suitcases through Prague’s cobbled streets. Make your final memory of Prague a delicious ‘trdelník’ (local sweet treat) instead!